My final Penn State course (Spring 2017) was about K-theory and operator algebras – the connection between these two has been central to my mathematical life. I wrote up lecture notes for this course, as has become usual for me. I’m pleased to report that these have now appeared on the AMS Open Math Notes page. This entry was posted in Teaching and tagged C*-algebra, K-homology, k-theory, topology, trace on January 18, 2018 by John Roe. 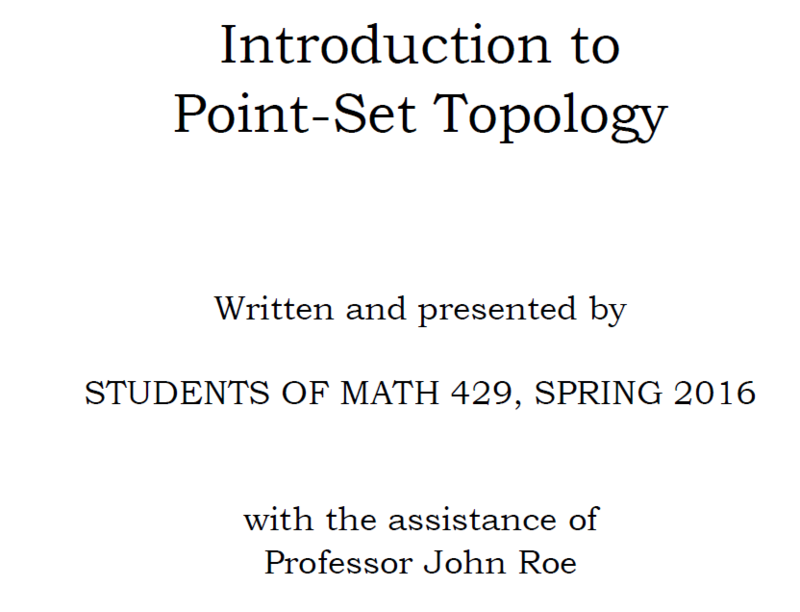 We’ve now finished the Moore method topology class that I wrote about in Topology: Moore or Less. It’s been an intense experience for everyone, I think. Many students have surprised themselves by what they have achieved. At the end of the course we printed off copies of the co-written course textbook (complete with frontispiece photo of the authors!) and everyone received one in time for the “open book” final exam. I hope that many students will hold on to these as a reminder of our common achievement. Here’s the cover. That seemed like a good place to stop. Students prepared their in-class presentations in “teams” of 4 rather than individually – this was a modification that I made to the standard Moore method. The online platform Piazza was the main mode of team collaboration – I held a couple of in-class sessions too where teams worked together and I acted as a roving consultant, but I should probably have done more of that. I hear what this student is saying, and wish I could have helped him/her better. One thing I would have liked to be able to share is that we all struggle, in math as in life, and that I had wanted the class to be a place where we could struggle together, not feel we have to project a brittle confidence or else stay silent. That will be something to work on for next time, if I do this again. Thanks, students! I really enjoyed the class and I hope you did too. This entry was posted in Teaching and tagged adventure, Moore method, topology on May 8, 2016 by John Roe. Heads up! 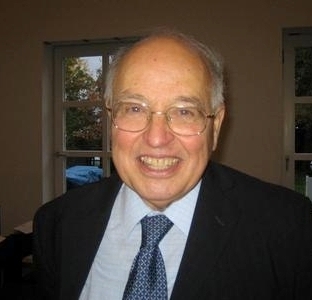 In a couple of days (April 22nd) it is the 87th birthday of “Britain’s mathematical pope”, (not just Britain’s, either, IMO), otherwise known as my doctoral advisor, Professor Sir Michael Atiyah. HAPPY BIRTHDAY MICHAEL! We are collecting messages of congratulations on the occasion of Michael Atiyah‘s 87th birthday Friday, April 22, 2016. If you have the time, memory, and an inclination, please also include your favourite personal story about Britain’s Mathematical Pope*. I keep hearing every mathematician has one – it would be a shame not to collect and archive them for posterity. Bonus points awarded for photographs, with prizes for the best MP4 video message we can share on the night. We will keep it simple and hope to collate and publish submisssions in due course. * = with thanks to Siobhan Roberts for the expression used in her recent biog of J H Conway – i have simply extended his Popedom from England to Britain. If you haven’t seen it, here is a great article from Wired last week: Mathematical Matchmaker Atiyah Dreams of a Quantum Union. This entry was posted in Uncategorized and tagged adventure, atiyah, birthday, history, index theorem, topology on April 20, 2016 by John Roe. In my earlier post on Tychonoff’s theorem, I talked about the original proof, based on the following characterization of compactness which is due to Kuratowski. Definition Let \(S\) be a subset of a topological space \(X\). A point \(x\in X\) is a point of perfection of \(S\) if, for every neighborhood \(U\) of \(x\), the set \(U\cap S\) has the same cardinality as \(S\). Lemma (Kuratowski) A topological space \(X\) is compact if and only if every infinite subset has a point of perfection. Now I will give the proof of this characterization (again following Wright). 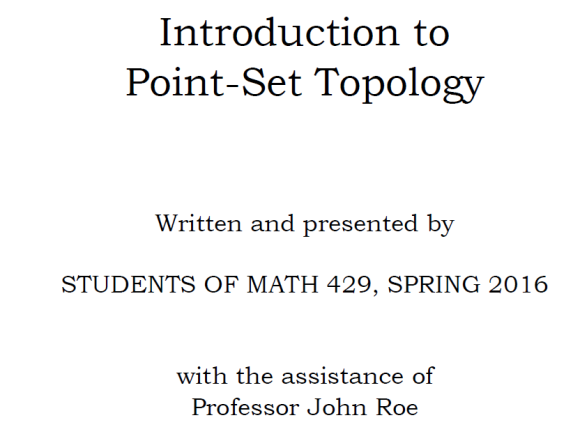 This entry was posted in Teaching and tagged axiom of choice, topology on February 18, 2016 by John Roe. Tychonoff’s theorem (an arbitrary product of compact sets is compact) is one of the high points of any general topology course. When I’ve taught this in recent years, I’ve usually given the proof using universal nets, which I think is due to Kelley. Recently though I read a very nice paper by Wright which reproduces, and then modifies, Tychonoff’s original proof (otherwise inaccessible to me because of my lack of German). I thought the original proof was really elegant and thought I would try to give an exposition. This entry was posted in Teaching and tagged axiom of choice, teaching analysis, topology on January 29, 2016 by John Roe.